Kris wins 2007 Scholarship sponsored by the Great White North Triathlon! 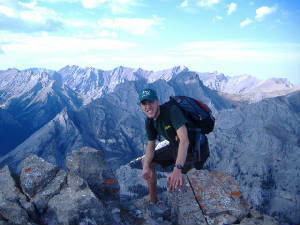 Kris voted 2007 'Junior Elite Athlete of the Year' by the Alberta Triathlon Association! August 21/08, Ironman Canada Subaru 5K Road Race. Kris runs an incredible 15:50 as he wins the Subaru 5K road race in Penticton, prior to Ironman Canada, that featured some Ironman Champions such as Mike Lovato, and Luke McKenzie. Brother Mike, finished 6th in 16:58. August 17/08, Canadian National U-23 & Elite Championships! Kris goes into Kelowna and takes home a silver medal in the U-23 and an 8th overall in the Elite and pockets his first payday! After coming out of the water a bit behind he and his group wheeled in another group on the bike to stay just minutes back of the lead group. Kris then used his run speed to start moving up the pack passing runners like crazy. He had the 4 fastest run split of the day posting a 33:23 for the 10K. Kris overall time was 2:00:05 for the 6 lap hilly Kelowna course! Kris places 3rd at the new Canmore Triathlon, and puts down the fastest run split of the day. 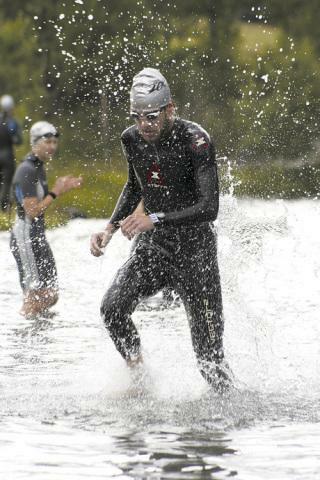 Centered in the majestic Rocky Mountains, the swim was in a small lake just down from the Olympic Nordic Center where the second transition and the run took place. 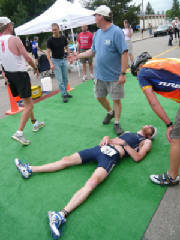 Kris, 20, hits the ground in exhaustion after winning his age group in the Great White North 1/2 Ironman, 2008 Long Course Provincial Championships in Stony Plain, AB last Sunday. Kris's time was 4:18:20 was good for 8th overall in this competitive field as athletes were trying to win 2008 Ironman Canada spots in Penticton, BC on August 24. July1/08, Kris wins Canada Day 5k Road Race. Kris decided to throw in a 5 k race just before the Half Ironman to see where his run speed was at. No problem as he wins in a time of 16:34 with brother Mike only 48 seconds behind in a time of 17:22.
Who does a prize purse of around $10,000.00 attract? Ironman, and Olympic distance pros from around the west coast of Canada and the US. This is one of the only races in Canada where age groupers and pros race at the same time on the same non drafting course. Posting some brilliant times ahead of him Kris out ran the whole field, except his training buddy Kurt Woytiuk, and finished just out of the money in 8th place in a time of 1:55:50 and running the second fast run split of 34:06. May 31/08- Kris wins KGH Sprint Triathlon! May 18/08- Kris wins the overall title in the Fast Trax, Vasque North American Trail Running Series! Kris wins all 3 races in this series to win the championship. He also set a course record in race #2. All these races were 10km cross country courses. 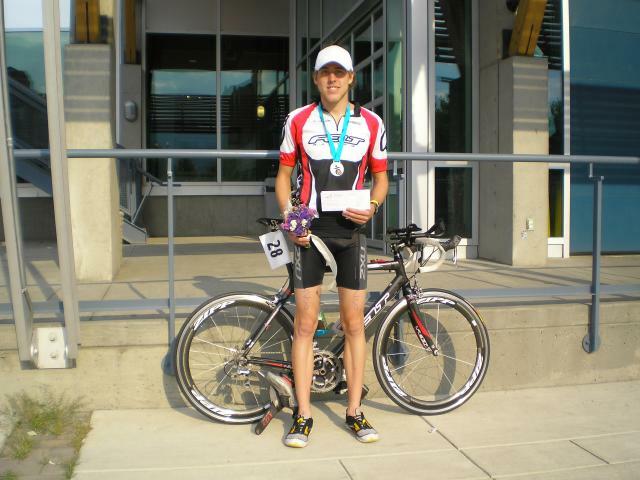 May 11/08- Kris wins Lethbridge Olympic Triathlon! On a cold miserable race day in Lethbridge on the weekend, Kris crosses the line in 2:05:18, picking up his first victory of the season. Exiting the water first in under 20:00 min he held on to his lead on the bike in windy rainy conditions, untill about the 35km mark. Once on the run he out ran the field, posting a run time of 36:15 including the dreaded 1km hill at the finish, to win the race! Kris, pictured with his first pro paycheque! Nationals in Kelowna! Mountain climbing and kayaking in the short off season! 2003, Alberta Triathlon Associations, Athlete of the Year! 2002, Alberta Triathlon Associations, Athlete of the Year!